Bigger dogs need bigger yards, and because of that, they’ll need bigger fences too. Keep your furry friend safe with the right fence! Is your best buddy one with four paws and tail? Bigger dogs need bigger yards, and because of that, they’ll need bigger fences too. Here’s how to choose the best possible fence for your large dog this summer. First of all, consider getting a new fence. Make this fence as tall as you can within the limits set by your homeowner’s association or by local laws. Labradors, golden retrievers, and huskies can get around average-sized fences, which are normally around four feet high. That means you’ll need a wood fence six feet or higher. Although you can try to extend the fence and modify it to make it taller, that will only encourage your dog to figure out how to get over it somehow. If that’s the case, you’ll have to get rid of your old wood fence and put in a new one. Although cats are often considered to be the smarter house pet, that doesn’t mean dogs aren’t smart. Your dog will eventually figure out how to get over your fences – or under them, depending on the circumstances. If you want aluminum or chain link fences to protect your yard, make sure it is as hard to climb as possible. A big dog might not be as nimble as a small one, but you don’t want to be in for an unpleasant surprise when they get out. If you don’t have any panels in your fences, this might be a good time to start looking at adding them. Lastly, think about what your dog can do. 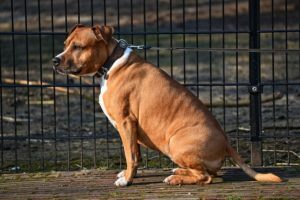 If your dog can open the door to get in and out of your house, then they can probably figure out how to open the gate in backyard fence or in the fence around the front yard. This entry was posted on Friday, August 10th, 2018 at 9:39 pm. Both comments and pings are currently closed.